This has been one of my favorite meals since I was a kid. This particular recipe is from my mom and I still absolutely love it. We made it last night and I thought I would share it with you all. This is a casserole that you can put together and toss into the fridge until you're ready to put it in the oven to cook. It freezes wonderfully as well. Salt and pepper the chicken and then bake. When it's tender, allow it to cool. Remove the meat from the bone (or skip this part if you baked chicken breasts) and break into bite-sized pieces. In one bowl, combine the soup, chicken stock from the baked chicken, green chiles, and seasoning. Stir together well and set it aside. If you use chopped onion, I usually stir it in with the chicken. At this point you'll have three ingredient bowls: that with the soup mix, the chicken (and onions, desired), and the cheese. Grease the casserole dish and layer the ingredients: Tortillas (3-4 per layer), chicken, soup mixture, cheese. Repeat these layers until everything has been used and top with extra cheese. Bake at 325'F for 35-45 minutes (it can take closer to an hour if you're pulling it out of the fridge). You'll know it's done with the sides are super bubbly. ​I hope you and your family enjoys this recipe! And a big thanks to my mom, Suzanne Allison, for the excellent recipe! Calla's disappearance leads her family and friends to suspect that she’s lost. In a desperate attempt to find her, Valcas seeks help from a man he betrayed. A new search begins, one that sounds promising, even if it forces Valcas to confront his past. The travel team reunites for a mission they never saw coming: a journey to a world caught between life and death, and hidden within the deepest recesses of time. Ivory rediscovers a friend and Ray learns the meaning behind his tattoo. But the connections they make between travelers and the lost may twist the core of the Time and Space Travel Agency inside out. 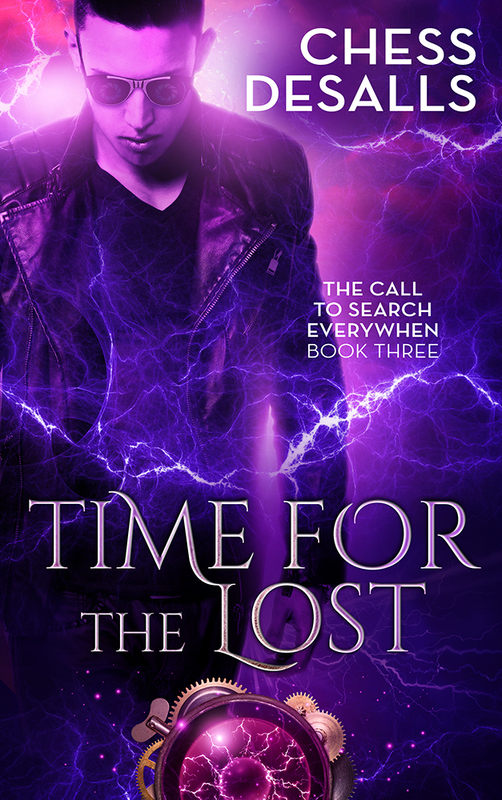 Time for the Lost is the third installment in The Call to Search Everywhen serial series. Catch up with Calla and Valcas' adventure before the third book releases in February 2016! 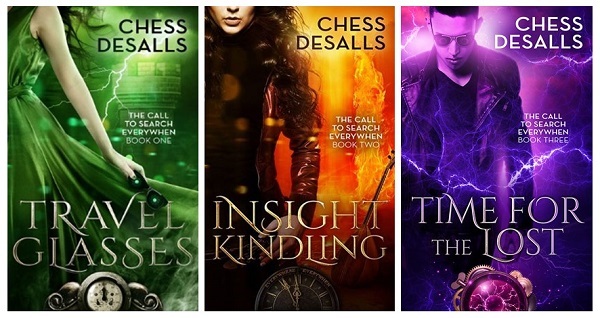 Chess Desalls is the author of the YA time travel series, The Call to Search Everywhen. She's a longtime reader of fantasy and sci-fi novels, particularly classics and young adult fiction. 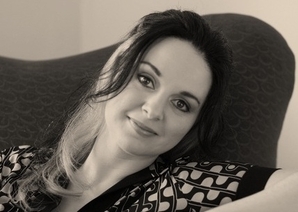 Her non-fiction writing has led to academic and industry publications. She’s also a contributing editor for her local writing club’s monthly newsletter. The California Writers Club, South Bay branch, has awarded two of Chess’ stories first place for best short fiction. When she's not reading or writing, she enjoys traveling and trying to stay in tune on her flute. My Favorite Holiday Cookies - Recipes Included! I normally enjoy baking. But when it comes to the Christmas season, my specialty is cookies. I bake a lot of them and enjoy every minute. I usually have more cookies I want to make than I actually make simply because there's no way my family can eat them all. So I find myself having to narrow down what kinds I'll make each year. My husband's favorite cookie is the traditional chocolate chip. Mine is double chocolate with mint chips (which varies year to year depending on what mint candy is available in the store). Yum! But I thought I would share a couple of my favorite, slightly less common, cookie recipes. Spread coconut on a baking sheet. Bake for 5 minutes, then stir every minute until toasted evenly. Let it cool. Mix flour and baking soda. Beat butter and sugar in a large bowl with an electric mixer until fluffy. Beat in the eggs and vanilla. On low speed, gradually beat in the flour mixture. By hand, stir in the toasted coconut. If the dough is super soft, chill for 30 minutes. Drop dough by rounded tablespoonfuls about 3 inches apart onto baking sheets. Bake 12-15 minutes until lightly browned. To make the glaze, stir together the powdered sugar and hot water until smooth. Add hot water if too thick. Drop a hot cookie into the glaze, using a fork to flip it over if you want glaze on both sides. Mix flour, oats, candy, and baking soda. Beat butter and brown sugar until fluffy. Beat in eggs. On low speed, gradually beat in flour mixture. Drop onto baking sheets by rounded spoonfuls. Bake 8-10 minutes until lightly browned. ** These are incredibly yummy, but I've personally started to bake them in a pan and then cut them into squares instead of trying to make cookies as they tend to really flatten out and stick together easily which makes storage difficult. This is a new recipe from last year and we loved it. In fact, we ended up making two batches last Christmas and when I started to talk about cookies the other day, this was the first recipe my daughter brought up. They are moist and just slightly chewy. So good! In a small bowl, whisk together flour, baking powder, baking soda, ginger, cinnamon, and cloves. In a large bowl, beat butter, brown sugar, and egg until well blended. Add molasses and vanilla, mixing well. Gradually stir in all dry ingredients and blend until smooth. Divide the dough in half and wrap each half in plastic. Let it stand at room temperature for at least 2 hours. (The dough can be stored in the fridge for up to 4 days). Place one of the halves on a floured surface. Use additional flour on the dough and the rolling pin. Roll it out to 1/4-inch thick and cut out the cookies with a cookie cutter. Don't remove them from the pan too quickly or they'll fall apart. If you need the cookie sheet to keep baking, you can drag the parchment paper from it and to a surface to allow the cookies to cool and that works well. I hope you give these recipes a try. If you do, let me know what you think. Do you have a favorite cookie recipe? Feel free to share, I'm always on the lookout for new ones! I'm so excited to welcome Shanna Hatfield back this year with her 2nd Annual Cowboys and Christmas Blog Tour. She has a lot of fun lined up for you all! There's the blog tour, a Facebook party, giveaways, and don't forget her two new releases. Check it all out below! Growing up on a farm twenty miles from the closest town, we generally took our excitement anywhere we could get it. 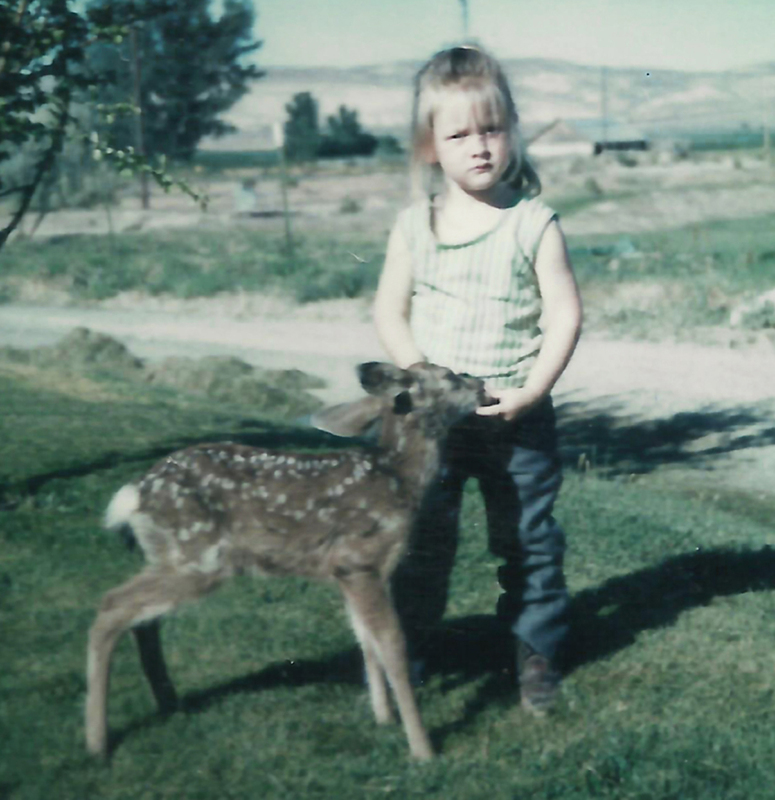 Author with the neighbor's pet fawn. Each summer, I eagerly anticipated our small town’s biggest event of the year - the Fourth of July Rodeo. Back in those days, it was a Professional Rodeo Cowboys Association-sanctioned rodeo. Some of the top names in the circuit would join hundreds of rodeo fans for four days of rodeo, events in the park, a parade through town, and the annual Suicide Race (a crazy horseback race down a steep butte, across the highway, through the river, and into the rodeo arena). The whole family looked forward to the celebration. My oldest brother regularly rode in the Suicide Race and some of my cousins often competed in the rodeo. For a horse-crazy little girl who loved the smell of leather and the sight of cowboy hats, it was amazing. From an early age, I had a romance with the rodeo. One of the few stores we had in town was a saddle-maker with a boot shop. When I was five, my dad took me to Leroy’s shop to pick out a new belt for the rodeo. It was the first time I could choose my own. Talk about excited! As we walked inside, the welcoming aroma of leather filled the air. Dad led me to where Leroy worked on saddle at the back of the shop and they talked a few minutes. Impatiently waiting, they finally told me to go see what I could find. My gaze - and heart - immediately settled on a hand-tooled belt with little flowers stamped into the leather and a silver buckle with a gold saddle that glistened in the overhead lights. I still have that little belt today along with my love of rodeo. It’s because of how much I enjoy watching rodeos that led to the creation of my Rodeo Romance series. Tate Morgan is a saddle bronc rider out to claim a championship title and the girl he loves inThe Christmas Cowboy, the first book in the series. Wrestlin’ Christmas, the second installment, shares Cort McGraw’sstory as a sidelined steer wrestler who falls for a widow down on her luck. ​In Capturing Christmas, Kash Kressley is a rodeo stock contractor who falls for a feisty rodeo photographer. To kick off the second annual Cowboys and Christmas Blog Tour and the JCCF campaign, two brand new holiday romances will release Nov. 12! Capturing Christmas is the third installment in the sweet holiday western Rodeo Romance series. Determined to capture the best images possible, rodeo photographer Celia McGraw is fearless and feisty. Not one to back down from a challenge, her biggest risk isn’t in her work. Danger lurks in the way her heart responds to one incredibly handsome stock contractor. Will Kash and Celia capture the spirit of the season? Get all three books in the Rodeo Romance series! The Christmas Vow is the fourth book in the Hardman Holidays sweet Victorian romance series. Columbia River Pilot Adam Guthry returns to his hometown of Hardman, Oregon, after the sudden death of his best friend. Emotions he can’t contain bubble to the surface the moment he sees the girl who shattered his heart eleven years ago. Widow Tia Devereux escapes her restrictive life in Portland, returning to the home she knew and adored as a girl in Hardman. She and her four-year-old son, Toby, settle into the small Eastern Oregon community, eager for the holiday season. Unfortunately, the only man she’s ever loved shows up, stirring the embers of a long-dead romance into a blazing flame. When her former father-in-law, a corrupt judge, decides he wants to raise Toby, Adam may be the only hope she has of keeping her son. ​You can pre-order your copy today for only $2.99! Don't miss out on the Hardman Holidays series! You’re invited to join in the online Cowboys & Christmas Facebook Party, Thursday, Nov. 12 from 10 a.m. to 2 p.m. (PST). Drop in anytime during those four hours to enter to win great prizes, chat with guest authors, and more (many of the giveaways will stay open until the following morning)! To enter the drawing for an Amazon gift card, Wrangler Tote Bag, Rock & Roll Cowgirl T-shirt, autographed books, chocolates, and more fun goodies, fill out this form. Winners will be randomly drawn and announced Nov. 16.
with the Hardman Holidays series. and is available free for a very limited time! When she isn’t writing or indulging in chocolate (dark and decadent, please), Shanna hangs out with her husband, lovingly known as Captain Cavedweller. 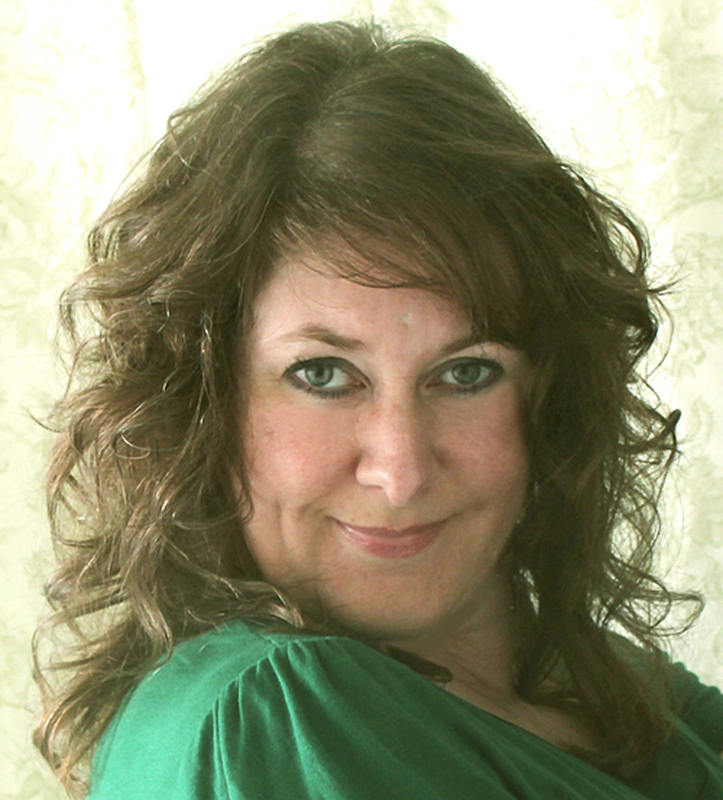 ​This USA Today bestselling author is a member of Western Writers of America, Women Writing the West, Romance Writers of America, Sweet Romance Reads, and Pioneer Hearts. Shanna loves to hear from readers!